The attention-grabbing activities on this colorful wooden play cube are sure to entertain and stimulate baby’s visual and spatial senses. He will track, roll, rotate and sort shapes with the help of friendly critters and a floating wire maze. 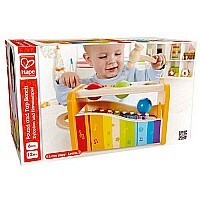 Its non-toxic finish and child-safe quality construction make it a favorite of parents. 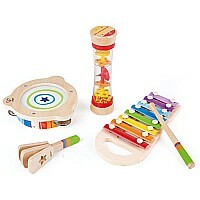 From Hape Intl, for ages 1-3 yrs.